Adult Caddisfly patterns are not as numerous as adult mayfly patterns and certainly not as glamorous. Often treated unfairly as a second class citizen Caddisfly adults are often misunderstood. At the time of emergence caddisflies spend much less time on the surface as mayflies. This however is compensated for by the fact that some caddisfly adults live for weeks and even months after emergence. Caddisfly imitations are tied in a wide range of hook sizes from 6 to 28, however most patterns run in the 18-12 range of hook sizes. The Goddard Caddis pictured here created by John Goddard is tied to as large as size 10 and as such is considered a useful and productive searching pattern. The most distinguishing feature of an adult caddisfly is the delta or tent wing construction so apparent on the natural. This wing style is not only easy to recognize in the wild but also easy to imitate in a fly pattern. Elk and deer hair wings are found in many recipes like the Elk Hair Caddis and/or hackle tip wings like in the famous caddis pattern Henryville. Buck Caddis (Dark color scheme) Pattern Recipe: Hook TMC100 sizes 8-14, Thread- Orange 6/0, Tail- Natural dark moose body hair, Rib- Working thread orange 6/0, Body- Orange wool yarn, Hackle- Brown palmered over body, Wing- Natural deer body hair. Bucktail Caddis (Dark/Orange Color Scheme) Pattern Recipe: Hook Mustad 7957B sizes 6-14, Thread- Orange 6/0, Tail- Natural dark moose body hair, Rib- Working thread orange 6/0, Body- Orange wool yarn, Hackle- Brown palmered over body, Wing- Natural deer body hair. Bucktail Caddis (Dark/Yellow Color Scheme) Pattern Recipe: Hook Mustad 7957B sizes 6-14, Thread- Yellow 6/0, Tail- Natural dark mottled deer body hair, Body- Golden yellow dyed fur dubbing, Hackle- Golden yellow rooster hackle palmered over body, Wing- Natural dark mottled deer body hair extending slightly past the bend of the hook. Bucktail Caddis (Light color scheme) Pattern Recipe: Hook Mustad 7957B sizes 6-14, Thread- Pale yellow 6/0, Tail- Natural light tan elk body hair, Rib- Working thread orange 6/0, Body- Light yellow fur dubbing, Hackle- Golden yellow rooster palmered over body, Wing- Natural light tan elk body hair. CDC Caddis Adult (Black Color Scheme) Pattern Recipe: Hook – TMC100 sizes 14-20, Thread- Black 6/0, Abdomen- Black Antron dubbing, Wing- Black CDC feather over black Z-lon, Legs- Black CDC feather, Thorax- Black Antron dubbing. CDC Caddis Adult (Gray Color Scheme) Pattern Recipe: Hook – TMC100 sizes 14-20, Thread- Gray 6/0, Abdomen- Adams gray Superfine dubbing, Wing- Natural dun CDC feather over gray Z-lon, Legs- Natural dun CDC feather, Thorax- Adams gray Superfine dubbing. CDC Elk Hair Caddis (Dun Color Scheme) Pattern Recipe: Hook- TMC900BL sizes 12-18, Thread- Gray 6/0, Rib- Working thread gray 6/0, Body- Adams gray Superfine dubbing, Hackle- Dark dun CDC palmered over body, Wing- Natural elk body hair. CDC Caddis Adult (Olive Color Scheme) Pattern Recipe: Hook – TMC100 sizes 14-20, Thread- Olive 6/0, Abdomen- Olive Superfine dubbing, Wing- Medium dun CDC feather over light dun Z-lon, Legs- Medium dun CDC feather, Thorax- Olive Superfine dubbing. CDC Caddis Adult (Tan Color Scheme) Pattern Recipe: Hook – TMC100 sizes 14-20, Thread- Tan 6/0, Abdomen- Tan Superfine dubbing, Wing- Ginger CDC feather over White Z-lon, Legs- Ginger CDC feather, Thorax- Tan Superfine dubbing. CDC Elk Hair Caddis (Brown Color Scheme) Pattern Recipe: Hook- TMC900BL sizes 12-18, Thread- Brown 6/0, Rib- Working thread brown 6/0, Body- Brown Superfine dubbing, Hackle- Brown CDC palmered over body, Wing- Natural dark elk body hair. Elk Hair Caddis (Black Color Scheme) Pattern Recipe: Hook- TMC100 sizes 10-18, Thread- Black 6/0, Rib- Fine copper wire, Body- Black Antron or Superfine dubbing, Hackle- Black palmered over body ,Head- trimmed Elk hair wing tips, Wing- Black or natural dark elk hair. Elk Hair Caddis (Brown Color Scheme) Pattern Recipe: Hook- TMC100 sizes 10-20, Thread- Brown 6/0, Rib- Fine gold wire, Hackle- Brown palmered over body, Body- Natural brown Hare's mask fur dubbing, Head- trimmed Elk hair wing tips, Wing- Light or bleached Elk Hair. Elk Hair Caddis (Dun Color Scheme) Pattern Recipe: Hook- TMC100 sizes 10-18, Thread- Gray 6/0, Rib- Fine copper wire, Hackle- Dun palmered over body, Body- Adams gray Superfine dubbing, Head- trimmed Elk hair wing tips, Wing- Natural light elk hair. Elk Hair Caddis (Olive Color Scheme) Pattern Recipe: Hook- TMC100 sizes 10-20, Thread- Olive 6/0, Rib- Fine gold wire, Hackle- Olive grizzly palmered over body, Body- Olive Antron or Superfine dubbing, Head- trimmed Elk hair wing tips, Wing- Natural light elk hair. Elk Hair Caddis (Tan Color Scheme) Pattern Recipe: Hook- TMC100 sizes 10-18, Thread- Tan 6/0, Rib- Fine gold wire, Hackle- Ginger palmered over body, Body- Tan Antron or Superfine dubbing, Head- trimmed Elk hair wing tips, Wing- Natural light elk hair. Elk Hair Caddis (Yellow Color Scheme) Pattern Recipe: Hook- TMC100 sizes 10-18, Thread- Yellow 6/0, Rib- Fine gold wire, Hackle- Pale yellow grizzly palmered over body, Body- Yellow Antron or Superfine dubbing, Head- trimmed Elk hair wing tips, Wing- Natural light elk hair. Fluttering Caddis (Black Color Scheme) Pattern Recipe: Hook- TMC100 sizes 16-18, Thread- Black 6/0, Body- Black rabbit dubbing, Wing- Black mink tail guard hairs, Hackle- Dark rusty dun wound collar style. Fluttering Caddis (Blue Dun Color Scheme) Pattern Recipe: Hook- TMC100 sizes 14-18, Thread- Black 6/0, Rib- Fine gold wire, Body- Gray muskrat dubbing, Wing- Dun hackle fibers, Hackle- Dark rusty dun wound collar style. Fluttering Caddis (Brown Dun Color Scheme) Pattern Recipe: Hook- TMC100 sizes 12-18, Thread- Brown 6/0, Rib- Fine gold wire, Body- Pheasant center tail herl, Wing- Brown spade hackle fibers, Hackle- Brown wound collar style. Fluttering Caddis (Ginger Color Scheme) Pattern Recipe: Hook- TMC100 sizes 14-18, Thread- Tan 6/0, Rib- Fine gold wire, Body- Ginger rabbit dubbing, Wing- Ginger mink tail guard hairs, Hackle- Ginger wound collar style. Fluttering Caddis (Grizzly Color Scheme) Pattern Recipe: Hook- TMC100 sizes 12-16, Thread- Black 6/0, Rib- Fine gold wire, Body- Peacock herl, Wing- Grizzly spade hackle fibers, Hackle- Grizzly wound collar style. Hairwing Caddis (Light Brown Color Scheme) Pattern Recipe: Hook TMC100 sizes 14-18, Thread- Tan 6/0, Body- Light tan rabbit dubbing, Wing- Bleached light elk body hair, Hackle- Cream wound collar style. Hairwing Caddis (Light Olive Color Scheme) Pattern Recipe: Hook TMC100 sizes 14-18, Thread- Olive 6/0, Body- Light olive rabbit dubbing, Wing- Bleached light elk body hair, Hackle- Ginger wound collar style. Hemingway Caddis Pattern Recipe: Hook- TMC100 sizes 12-18, Thread- Olive 6/0, Body- Olive Superfine dubbing palmered with medium dun hackle, Wing- Drake mallard duck quill segments, Underwing- Mallard wood duck flank, Thorax- Peacock herl, Hackle- Medium dun tied collar style. Henryville Special Pattern Recipe: Hook- TMC100 sizes 12-20, Thread- Black 6/0, Rib- Fine gold wire, Ribbing Hackle- Grizzly one size under wing hackle palmered over body, Body- Olive Superfine dubbing, Underwing- Drake wood duck flank fibers, Overwing- Mallard feather section folded over body and cut to tent shape, Hackle- Dark ginger tied collar style. Peacock Caddis Pattern Recipe: Hook- TMC100, Thread- Dark brown 6/0, Hackle- Brown and grizzly wrapped as a collar, Wing- Natural Elk hair tied as a hair down wing, Body- Peacock herl. 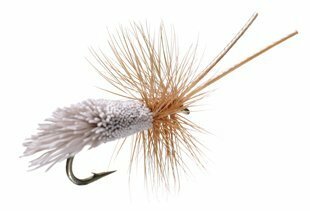 Quill Wing Caddis (Ginger Color Scheme) Pattern Recipe: Hook- TMC100 sizes 14-18, Thread- Tan 6/0, Body- Natural tan fur dubbing with guard hairs, Wing- Light colored turkey feather section tied tent style over body, Hackle- Ginger tied collar style. Quill Wing Caddis (Gray Color Scheme) Pattern Recipe: Hook- TMC100 sizes 14-18, Thread- Gray 6/0, Body- Natural muskrat fur dubbing with guard hairs, Wing- Mallard or teal secondary feather section tied tent style over body, Hackle- Medium blue dun tied collar style. Quill Wing Caddis (Olive Color Scheme) Pattern Recipe: Hook- TMC100 sizes 14-18, Thread- Olive 6/0, Body- Peacock herl, Wing- Gray goose primary wing feather section tied tent style over body, Hackle- Dark blue dun tied collar style. Slow Water Caddis (Black Color Scheme) Pattern Recipe: Hook-TMC 100 sizes 12-18, Thread- Black 6/0, Body- Black Antron or Superfine dubbing, Hackle- Black palmered over thorax trimmed off underbody, Wings- Black duck quill sections tied in tent fashion with length well past the hook bend. Slow Water Caddis (Brown Color Scheme) Pattern Recipe: Hook-TMC 100 sizes 12-18, Thread- Brown 6/0, Body- Brown Antron or Superfine dubbing, Hackle- Brown palmered over thorax trimmed off underbody, Wings- Dark brown duck quill sections tied in tent fashion with length well past the hook bend. Slow Water Caddis (Ginger Color Scheme) Pattern Recipe: Hook-TMC 100 sizes 12-18, Thread- Tan 6/0, Body- Tan Antron or Superfine dubbing, Hackle- Ginger palmered over thorax trimmed off underbody, Wings- Light duck quill sections tied in tent fashion with length well past the hook bend. Slow Water Caddis (Gray Color Scheme) Pattern Recipe: Hook-TMC 100 sizes 12-18, Thread- Gray 6/0, Body- Gray Antron or Superfine dubbing, Hackle- Blue dun palmered over thorax trimmed off underbody, Wings- Blue dun colored duck quill sections tied in tent fashion with length well past the hook bend. Slow Water Caddis (Olive Color Scheme) Pattern Recipe: Hook-TMC 100 sizes 12-18, Thread- Olive 6/0, Body- Olive Antron or Superfine dubbing, Hackle- Ginger palmered over thorax trimmed off underbody, Wings- Dark ginger duck quill sections tied in tent fashion with length well past the hook bend.